My ultimate goal in life is to make things people want, which depends on understanding people. Having spent my entire life until 28 all in California, I felt like I understood only a small sliver of the world, which is why at the beginning of 2016 I decided to leave and travel with Remote Year (cue baby boomer shaking fist at “those darned millennials”). Today, I'm still on the road and working on Wanderprep.com, a to-the-point travel resource because I realized how friction filled traveling was (not unlike Pack Hacker!). I go to Taiwan a lot, partially because my relatives are there but also just because it's an amazing (and under appreciated) destination in its own right. Delicious food, affordable, hip stores/neighborhoods, efficient public transportation, and friendly people. Bose QC20 Noise Cancelling Earbuds: I was pretty skeptical of these at first and probably wouldn't have bought them myself since they're expensive ($250). However, after receiving them as a gift I use them nearly everyday. Great for blocking out noise in cafes and airplanes to really hunker down and focus. 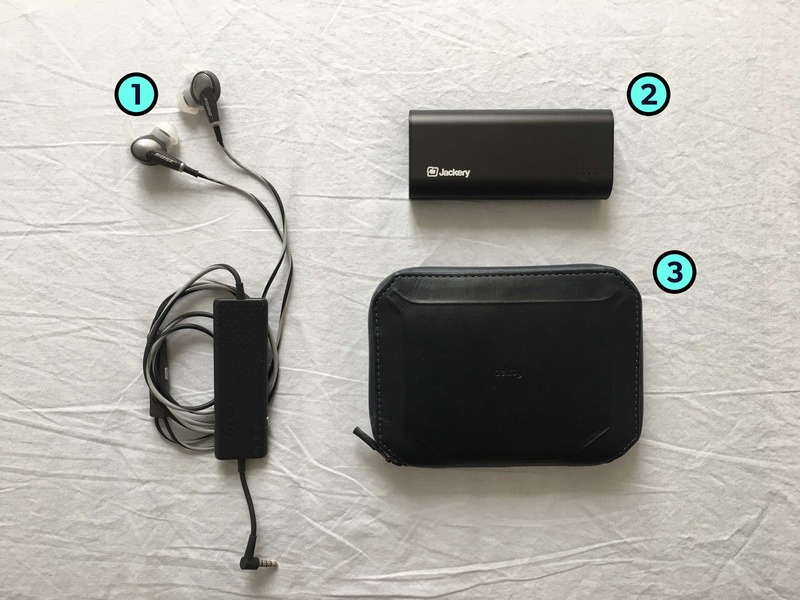 Jackery Bolt 6000mAh Power Bank: My most used item by far while traveling is my power bank. I currently have a Jackery Bolt 6000mAh with integrated lightning and micro USB cables, which is the key detail to me. No one wants to deal with extra cables while traveling. It also charges up to 2.4 amps which is pretty much as fast as it gets for not being plugged into a wall. Bellroy All-Conditions Phone Pocket: They no longer sell the version I have unfortunately. It's kind of like the All-Conditions Phone Pocket but the size is optimized for passports. It's really durable, has a water-resistant YKK zipper, and lets me stuff 2 passports in addition to extra cards/cash without worry (I have visa papers in my old passport that I sometimes need). My sister/brother in law gave it to me before I left too so it has sentimental value. Offline Google Maps is probably still my favorite useful “travel hack” that most people don't know about. I'm waiting for Elon Musk's satellite based internet service to become operational. Never needing to buy and switch SIM cards in every country? Take. My. Money. I get bad allergies a few times a year. Discovering nasal irrigation made a huge difference in my quality of my life. For those that don't know, it basically means rinsing your sinus passages with saline water. Most people think of neti pots, but there are motorized versions that make it much easier and more comfortable. However, they're huge and take up a lot of counter space. That would be my #1 thing I wish they made a good travel version of. There is one motorized small version that is commonly seen in drug stores but the quality is utter crap. So related to my above answer on nasal irrigation, the solution I settled on is a nasal rinsing syringe. I'm sure I look extremely cool using it. Yeah, it looks pretty weird but as a travel solution it definitely works better than a neti pot and is easier to pack as well. Those tiny pieces of rolly luggage Europeans are often seen using (they're like 60% the size of a typical carry on luggage). The weight of all the materials used to make the luggage is likely more than what you can actually pack inside. It makes 0 sense to me. Use a daypack! Thanks for providing pretty useful Information. Good article.